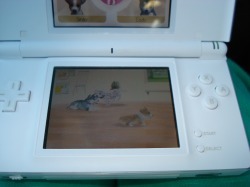 Nintendogs... What a great game! When you get home after buying your new puppy, you will need to spend time playing with it before taking it on a walk. After your dog settles down, you will be able to say your new puppy's name. Be sure to say your puppy's name clearly, or it won't understand it. Also, make sure you say your puppy's name in a quiet room, or it'll get confused with other sounds. Now that your new puppy knows it's name, you willl need to care for it. How do you do this? Just go to the 'Go Out' Section on your home page, click 'Shopping' and then click "Pet Store'. There, you can buy water and dry dog food. 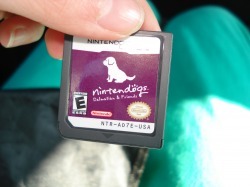 You can get more types of food and drinks for your dog when you get more trainer points(explained in the next paragraph) You can even buy collars and frisbee's. To feed your dog, go to 'Supplies' on your home page. Then go to 'Care'. There will then be a list of the care supplies. Click on which ever supply you may need. You will also need to buy shampoo and brushes. They are also at the pet store. You will need to buy shampoo or brush for the appropritet coat on your dog. To check you see wether you dog is long or short-haired, go to your home page. Uder your puppy picture, there is a ? mark. Click this. 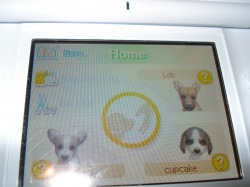 Here, you can view you dogs status(how hungry, thirsty, dirty it is, and how much time you've spent with your puppy.) You can also see the tricks your dog has learned, and what competions it has won. Under the Word 'coat' it will show how dirty your dog is, and also shows what type of coat it has. After buying the shampoo/brush, click on it (under the 'care' list in 'Supplies') You and your puppy will be in another room. Washing your dog just involves rubbing the stylus over your dog's coat. (Hint: They don't like it when you scrub their tail or face) Keep washing your dog until the water sign starts to blink. Click this and move the water around and wait until all the bubbles are gone. The bath is done! To get your dog extra clean(and keep it clean longer) Use the brush. Do the same thing as you did while bathing your dog. (Hint: they don't like thier head, front leg, and tail brushed) Once your dog is full, quenched, and clean, you can do a lot of fun things with your puppy! Trainer points show how good of a trainer you are and how long you've played it. You can find how many trainer points you have by clicking 'Go Out' On the bottom of the screen, There's a button labled 'Info' After clicking that, look for the button labled 'Trainer Info' On the bottom left-hand side of the screen, It should list your trainer points. To get more trainer points, you can go for walks, enter competitions, and take care of your puppy. One trainer point is added for every minute you spend with your dog. The more trainer points you earn, you can get differnt types of dog breeds, types of dog food/drinks,and differnt types of home designs. 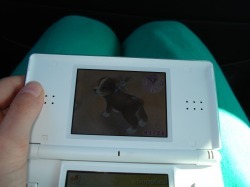 You can lose trainer points by not playing Nintendogs for a while... So try to make time to visit your puppies!!!!!! Puppies LOVE to go on walks. To take your puppy on a walk, touch 'Go Out' then Walk'. 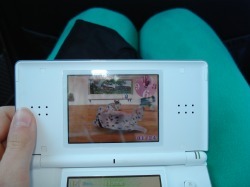 This brings you to a screen where you can choose which puppy to take(if you have more than one) Move the paintbrush to the places you want to go. 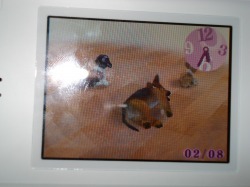 On the left side of the screen is your dogs stamina. When it runs out, you can't go any farther. When you first get your puppy, it will have very little stamina. After walking your dog a couple more times, its stamina will grow and they can go farther. If you mess up, click the earaser icon. You can also use the stylus and click backwards on your path. There are many places you can go, including the dicount shop, agility training center and the park, where you can practice disc competions. If there are other dogs in the park(there are 2 parks) and you want to practice disc, don't go there. The other dogs will get in the way. You can go there is you don't want to do disc... At the discount shop, you can get food and drinks for a dicount... you can also buy treats and toys for your puppy. When you are making your walking path, go over the ? marks. There, you will either get a present or meet one of the neighborhoood dogs. When finished, move the paintbrush back to your house.You will then start walking your dog. Your dog will have to go to the bathroom. If it does go poo, touch it to pick it up. If you don't, They nieghborhood will say bad things to you and about your dog. When you are finished walking your dog, you can not walk that dog again for 30 min. Have fun! Disc Competitions- Make sure you practice before entering! Practice at the park. Throw short throws first to get your dog used to catching the disc.To throw the disc, take the disc and quickly move the disc up, letting go at the end. If you don't get it, see 'Disc Competitions' book in your care supplies. When you think your ready to enter, tap 'Go Out' and then Competitions. The farther you throw the disc, the more more points you get. You have to get the number of points that the annoncer tells you. Agility Trials- You definetly have to practice for this, or your dog wont get how to do it. Practice at the gymnassium. Your dog will start off jumping hurdles. To do this, Tap the hurdle. You can do this twice to make sure the puppy doesn't walk away. There will also be tunnels. Lead your dog through it. You have to come out the oppostie end your you will lose points!When you get higher in the contest, you can get double-hurdles, see-saw's, and weaves. For the double-hurdles, you just need to teach your dog to jump farther. For the see-saw, Get your dog onto it. Slowly lead your dog up it. 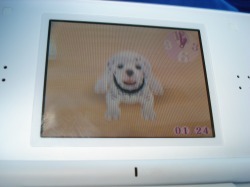 Tap your stylus behing our dog to keep it on. If your dog jumps off, don't worry. See-saw's are harder. For the weaves, you will need to have your dog weave around them. Wait until your dog can do it faster.... they will start it by walking. For more info on this, read the Agility Trial book in your care supplies. Remember... Faster is better! Obedience Competitions- This competition is the hardest of all, for getting your dog to listen to you is the hard part. The annoncer will tell you command(s) to do. Say them clearly into the microphone. You have to do this before the time runs out. At the end, the 3 judges will judge your dogs performance. Don't worry if your dog loses... Only one out of my 6 dogs got past beginer class! 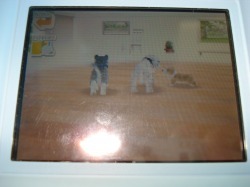 Bark Mode is where you can meet other dogs! Get together with a friend and go on Bark mode. To do this go to Go Out then Bark Mode. 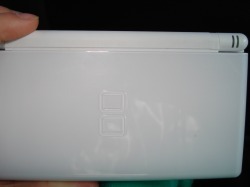 You will need to have the other persons DS close to yours. You can bring a present to the other dog if you want to... you can also send a voice meessage! To send a voice message, go to your supplies and tap 'Music' Then tap 'White Record' There you can record a voice message. When you meet someone else on Bark Mode, your trainer info will be sent. After meeting the other dog, that person will be added to your friends list! To find this, go to Go Out, tap Info, and go to Friend List. I hope you have fun! Putting accessories on your dog is really fun and cute! You can get collars at the stores... but the unique ones are the ones you find on walks!!!! You can also find cool hats, glasses, and ribbons to put on your dog. To get your accessories, go to your supplies and tap Accesories. There you can put accessories you have on your dog. Different accessories shows what type of personality your dog has. There are many toys to play with your dog... they are in the supplies section under Toys, Sports, or Ect. Playing with your dog is fun... it also gives your dog excersise. You can get toys at the discount shop or on walks. Here are some of the toys that you may need to know how to use: Balloon: Blow into the microphone to inlarge the balloon(It will pop, so buy more than one!) Bubble Blower: Blow into the microphone to blow the bubbles(Hint: Some puppies will love it, some will be scared of it!) Pull Rope: Wait until one of your dog take hold of it. Quickly trust it upward(still holding it) your dog will be hanging on to it! What a game of tug-o -war! Jump Rope: Let one of your dogs take the other end. Start to move the jump rope in circle so your dogs can start to jump! The Jack Russell Terrier is sorta like a "Bonus Pup" because to get this breed into your kennels, you will need to find the Jack Russell book on your walk. I bet you can't wait the get this cute pup into your kennels! 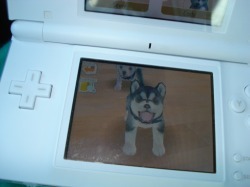 Have fun with your Nintendogs!